It was the first year of the rule of Meiji the Great when this restaurant, Tagoto Sanjo, was founded. Japan was modernized during this period, but traditions were also not let go. This can be seen at Tagoto; soba noodles are served in traditional Japanese style, with small hints to modernity and change – though lately these hints seem to be getting stronger. There is a garden in the back of the restaurant, and you can gaze at the garden if you choose to sit on the Japanese style seats. Especially worth a mention is their spicy ebi-taiko, seasoned pollock roe and shrimp in thick broth. It is easy to get to Tagoto from subway Kyoto Shiyakusho-mae station; just enter the Sanjo shopping arcade and you are bound to find the restaurant. It is also interesting to note that Tokyo is considered to be the “home ground” of soba, and that the fifth and sixth generation chefs both learned noodle making in Tokyo. Though I dare to say they may have already surpassed Tokyo with their spicy ebi-taiko. The pollock roe and shrimp is a divine combination when put together. The flavor is really strong for soba; in fact sometimes you get ramen that has a lighter taste than this dish. The taste of the pollock roe is truly something special, so special in fact that it is a little hard to describe it in words. Although my opinion on this matter may be considered sacrilege, in this soba this there is something foreign, especially when you add some yuzu citrus shichimi on the soba the taste starts to faintly remind me of Thailand, which is not at all a bad thing. This dish made me like soba even more than I did before, opened my eyes to soba’s potential, since while the taste is strong it you can still taste buckwheat – even more than in some other soba dishes. This dish is a modernization of soba, but at the same time it does not let go of tradition. Kamoseiro, or duck soup with soba, comes with a hot duck broth and cold noodles on a zaru, or a bamboo sieve basket. This basket is a bit special here; you get your soba in a “double-decker” basket, so soba on the lower part will stay moist while you eat the soba on the upper part making it possible for you to enjoy the soba even more. This style of soba is from the eastern side of Japan, but this dish was arranged to Kyoto style by the sixth generation chef. There is definitely something Kyoto in the broth, something quite refined. This dish is for those who want a traditional soba experience, for those who really want to take in the taste of buckwheat. The soba noodles here are exquisite as they are, but you can actually make them taste even better, or at least change the taste a bit when you are halfway through your bowl. Yuzu shichimi togarashi – yuzu citrus seven-flavor chili pepper – that they serve at Tagoto has an almost completely different taste from the normal seven-flavor chili pepper taste you get at other restaurants, but the citrusy taste of this pepper goes with the noodles like soy sauce goes with sashimi. At Tagoto they also have an English menu so ordering is easy. 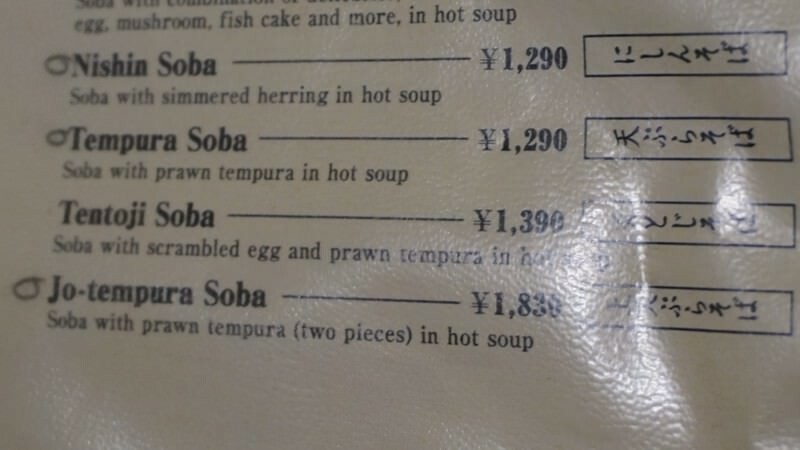 This is not really an order tip, but the chef wanted everyone to know that you should eat your soba right after you get it, as this is when the soba is the most delicious. It is considered good manners to wait for other people in your group also to get their food before you start eating, but in the case of soba you should eat the dish as soon as you get it. Tagoto has done business at the same place for over 140 years! Though in Kyoto that is not an exceptionally long time, it does feel long compared to other places in the world, especially when you take into account that the restaurant has been owned by the same family since 1872. It is said that the founder of Tagoto learned soba making from the chief priest of Daiko-ji Temple. Tagoto is a restaurant inside the Sanjo shopping arcade so it is really easy to go to, being also really close to subway Sanjo station. I ate kamoseiro – duck soup with soba – and I got a lot of noodles so I am sure you won’t be disappointed. You can make the soup spicier if you add some yuzu citrus shichimi spice mix to it! The restaurant seems to be really popular with the locals but as they have an English menu and English speaking staff, the restaurant is also popular with tourists. Tagoto has an English menu and have staff who can speak basic English in the restaurant every day, so you don’t need to worry about Japanese here.